Joe made this shot at the former Sweet Breads Bake Shop in Cleveland, GA.
"I think you can tell from the pics that the frosted bean pot has thinner walls than the original ones. And it has the overlapping top with an air hole, and no ridge on the inside of the mouth as do many of the others. The clay color shows up well in the pics. "I also have another Marcrest invention: (I have about 25 large divided serving bowls) First, for display, you can place one crossways on a shelf and then (if you have a wall behind the shelf) you can stand another, on end, inside the first. When you have 6 or more, they make quite an impressive display. As to the use: for chili (or soup or stew) and cornbread: (Serves 4) Place four Marcrest divided bowls in the oven at about 350-400 degrees (whatever temp you use for the cornbread) with either butter or bacon grease or whatever you use to shorten your cornbread. Allow the shortening to melt. Using potholders (of course) roll the melted shortening around to coat the inside of both compartments of the bowl (I use about a tablespoon in each compartment of each bowl). While the bowls are heating in the oven and the shortening is melting, mix up your corn bread batter, without shortening, and add the excess from the bowls, beat it in and the pour about 1/2 cup or more batter into each half of the divided bowl (It is ok if there is some excess shortening, it will keep the cornbread from sticking and help carmelize the outside of the cornbread.). Bake according to your receipe and then remove them to cool for about five minutes. Then, take out one of the pieces of cornbread (it should push right out with a fork) and place it atop the other piece, and pour in your chili, soup or stew into the vacated compartment. 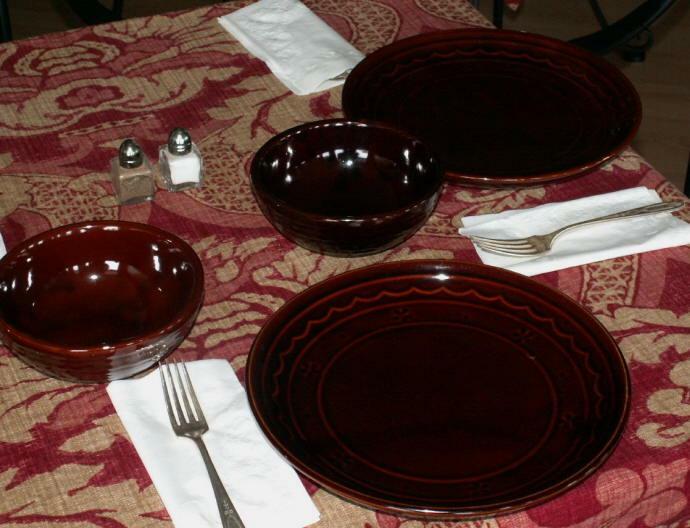 Place a cloth napkin, small towel or pot holder on a Marcrest dinner plate and then place the divided bowl on top. The bowl will keep both cornbread and chili hot and with the plate (with the piece of cloth between the two) it works well when eating out of your lap, in front of the tv, etc. (No cast iron pan or dutch oven to wash!) I have served groups of at least 10 people this way and though it makes for some large dirty dishes, it is really a conversation piece! I am always looking for new ways to utilize and display Marcrest. I haven't written down many receipes in my career, so please feel free to flesh out the above if you think it is necessary. It really does work and makes quite a nice setting as well as being an easy way to serve. Besides, there are limited uses for that divided bowl. This way, you can use a bunch of them and they are one of the most common pieces and cheapest." Joe, thank you for not only your great pictures, but also your decorating and recipes ideas!